I’m so excited to share an interview from my friend Stephanie Shott today, where she talks about her new book The Making of a Mom! Stephanie is the founder The Mom Initiative (the amazing mentoring organization I’m part of that I’ve told you about before), and she’s an incredible author, speaker and leader as well! Take a minute to read how her own story and her heart for moms led her to start The Mom Initiative and write her book. I promise you’ll be inspired! And be sure to read to the end of the post, where you can click to pre-order her book and check out a sample chapter! QUESTION: How did your passion for mentoring moms begin and what prompted you to start The MOM Initiative? Stephanie: The ministry (The M.O.M. Initiative) was conceived in a parking lot of a gas station when I glanced over and noticed a young girl waddling by. She was young in years, but great with child. And I couldn’t help but wonder if she had someone who was going to take her mom journey with her or if she was going to have to go it alone. I reflected on my own mom journey and remember how hard it was as a teen mom, as a single mom and even as a married mom. Motherhood was messy for me and as I talk to moms around the world, they say the same thing. Motherhood isn’t easy and children don’t come with instructions. After I became a Christian I remember wondering where all the Titus 2 mentors were and why couldn’t I find someone who could help me in my mom journey. So, as I sat in the gas station parking lot that day, I wondered what it might look like if the women inside the church walls would mentor young moms, not only there in the church, but also beyond the four walls of the church. Wouldn’t that be an amazing way to impact our communities and this culture for Christ through the power of mentoring? QUESTION: Why do you think moms feel so alone and overwhelmed? Why don’t we have more support? Stephanie: I think there are a multitude of reasons. We live in a culture of very independent lives. We go home, close the doors and we barely see our neighbors. We grow up learning to be strong and independent, so we often confuse the need for others as some sort of weakness. Sometimes it’s hard to allow ourselves the luxury of having someone speak into our lives and help us along the way. It’s not always convenient to set aside time to be with other women. We are always on the go taking care of things for our families, so slowing down long enough to nurture other relationships other than the ones within the walls of our homes is very difficult. If we are going to enter into the culture of community that Christ created us for, it will have to be something we are intentional about. That’s why I started The M.O.M. Initiative and wrote The Making of a Mom… the provide church with the support and the resources that would give small group leaders and mentors the courage and confidence to step into their Titus 2 shoes. I wanted to write a book that would answer those 3 questions. What would I say? There are questions at the end of each chapter that will serve as a catalyst for conversation so leaders won’t wonder what to talk about. What would I do? There are venue specific Planning Guides at the end of the book that will help leaders know what they can do during their time with a mentee or group of mentees. What would I use? The Making of a Mom is written to be a resource form moms to read on their own and for the church to use to minister to moms in the midst of their mom journey to help a mom discover what real life biblical motherhood looks like. QUESTION: What do you hope to accomplish through The M.O.M. Initiative and The Making of a Mom? The ministry was created and the book was written to minister to the hearts of moms who know Christ and to reach those who don’t. 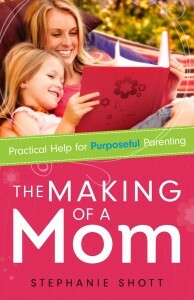 While it lays a solid biblical foundation of motherhood and provides 12 key ingredients to the making of a mom, the ministry is evangelistic in nature and the book is a resource for the church to not only weave mentoring into the fabric of the church but to also make mentoring missional and minister to moms who are unchurched. This is the part where you might think I’m crazy, but I want to change the world. And if only 3 moms in 1/2 of the churches in the United States would mentor just 3 other mothers, that would translate into reaching a MILLION MOMS for Christ and impacting over 2.5 MILLION CHILDREN! I can’t get past that. The calling is so compelling and we can literally change the world through missional mentoring. Mothers mold the heart of the next generation, so if the hand that rocks the cradle rules the world, then the church that mentors those hands will win it. I’m asking every ministry leader to link hearts and hands with me to help me minister to the precious moms who know Christ…to reach those who don’t and to change the world one mom at a time. « You’re a gardener, mom.